Exchange Student and Vacaville Rotary – THANKS! 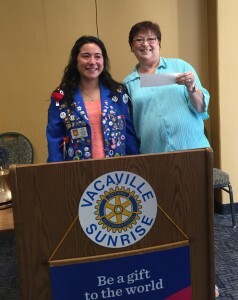 Exchange student Marie Paulo-Hernandez, from France, recently raised $700.00 on her own initiative, for Solano Midnight Sun, through the Vacaville Sunrise Rotary Chapter. Thank you Vacaville Sunrise Rotary Club, and especially to Marie Paulo-Hernandez, for your generosity and heart for Solano Might Sun and Breast Cancer patients!